I first went to a Divine Light Mission satsang (i.e. meeting) in late 1973 in Sydney, Australia. There was music played every night usually by a group centered on Lindsay Field and Joe Creighton who later were part of One Foundation and Trevor Wilson. I don't remember Kim O'Leary being there (there's lots I don't remember) though she played at other times with them under the moniker Rhythm in Bliss. Apart from Joe showing his Irish roots in some of Van Morrison's more spiritual songs (Lord, If I ever Needed Somone & Brand New Day) they often played some of the songs from this book. King of Kings, One in the Spirit, Peace and Bliss is Satguru, Spread this Knowledge and You Are My Only Light are the ones I remember being most often sung and it was the same when we moved to Queensland and attended satsang in Brisbane. Most of these songs are from the 'The Guru Puja 74 Song Book' published in 1974 by Divine Light Mission Inc., Denver - Colorado. For those unfamiliar with this song, in about 1979, Mahatma Guru Charnanand, who everyone considered to be the closest person to M outside his family, recorded English language versions of various Indian devotional songs on a cassette named 'You are my Everything'. Also on this album were other devotional songs from the group 'One Foundation'. In my opinion this song was one the best devotional songs recorded. The instrumental version of this song was released on a mid-nineties album. It was also quite clear that this was done with Maharaji's blessing. 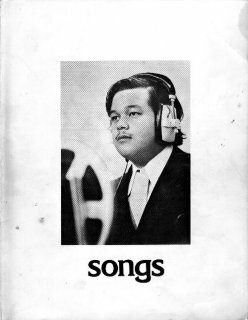 This song was a famous one in Divine Light Mission in the '70s, and it's still sung to him today in the 90s during programs with Maharaji, though the lyrics have been bowdlerised. Like the flower calls to the bee. Like the rivers rush to the sea. By Your Mercy, can we approach You. You're the one that we need. Show us why we're alive. Let us come back Inside. We've only sorrows to give. And You're the reason we live. And make You smile every day. To call Your lost children home. And this is not the time for weeping. If you open your heart . Now the age of air. Now hear His children sing. Now He's given one to me. Yes You shine for all, My Lord. I always want to be very near to You. That brings true love to the earth. You are my all, my Lord. I will always love you forever. Living our existence as a lie. In the Holy Word of Light. And make the sweetest poem seem incomplete. It's Guru Maharaj Ji's Grace. Guru Maharaj Ji's the One, One. Guru Maharaj Ji's Grace, Grace. We thought You'd never come. He's gonna turn the whole world on . A light inside us all. And who will be young when the sun cycles run? If you put your trust in these things . Oh, don't you put your trust in these things. For their true selves to appear. You'll know love is true. To tell them our Lord Is here. And heaven will be here. Truth Is the consciousness of bliss. Yes it is. Yes It is. Yes It is. Yes It is. All things must surely pass. You soul inside it will always last. The secret that is keeping you alive. We say that just because we have seen it. There is peace lying right between your eyes. Yes there is. Yes there is. Yes there is. Guru Maharaj Ji will show you. You talk as If you haven't got a care. With a heavy pack along a dusty road. Living in duality we never find reality. I love You, my Lord. To thank you, my Lord.